Terrence Malick's Cathedrals of Cinema: Excerpt from "Faith and Spirituality in Masters of World Cinema, Vol. 3"
Devoted—or devout—moviegoers often describe the experience of seeing a film in a theater, with its communal response to an artist’s themes, images and “message,” as a quasi-religious experience. This is common even among viewers who have no experience with, or interest in, the traditions or the texts of organized religion, much less a belief in any particular god or gods. I suspect devoted is one way of describing the sort of contributor that Faith and Spirituality in Masters of World Cinema, now in this its third volume, attracts. For me—a critic who was raised among Mormons and Jehovah’s Witnesses, but whose own religious leanings tend more toward the agnostic or atheist end of the spectrum—cinema’s quasi-religious potency evokes feelings of awe, or reverence, for the mysteries of human experience that I’ve rarely felt in houses of worship. One filmmaker in particular has captured—even sharpened—my attention in this way for years. Some people make films. 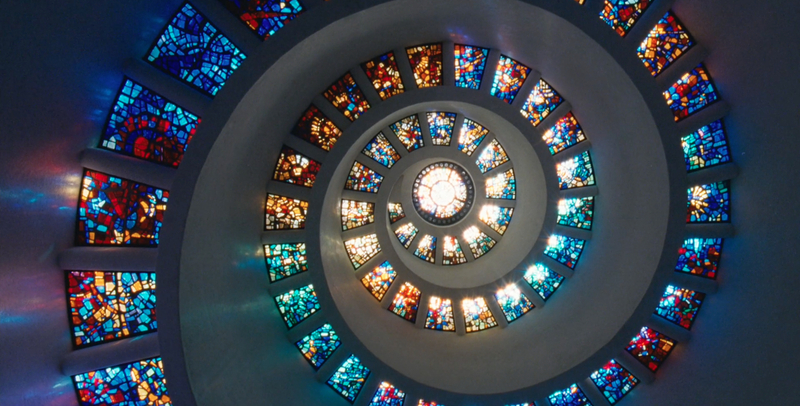 Terrence Malick builds cathedrals. Instinctively, I wrote that in my 2005 New York Press review of Malick’s The New World, not realizing all the ways in which it was true. What I was trying to get at was the sense of wonder that the filmmaker evokes. Malick awakens this response quite strongly among those who respond to his work, and in my own admittedly anecdotal experience, I’ve found little difference in response between those who consider themselves specifically religious, generally “spiritual,” agnostic, or atheist. There’s something about the way Malick shoots, cuts and scores action—the things he chooses to show us or not show us; the things he considers significant—that evokes these feelings. The biographical facts give us some insight, even if these alone don’t illuminate his artistry. We know that his parents were Assyrian Christian immigrants, that his name is one of the Names of God in the Qur'an—one that means The King, or the Lord of Worlds, or King of Kings. We know that he grew up in former Confederate states where derivations of Christianity dominate and the landscape is dotted with as many crosses as you’d find in Brazil. I’ve been told by people who know and work with him (he’s famously private) that since the 1990s he’s aligned himself with a benevolently evangelical strain of belief, and that his collaborators see him as a mysterious and obsessive but essentially kind guru who loves nature hikes and bird watching. We know that he’s always been preoccupied with phenomenology and with Wittgenstein and Husserl, and that at Harvard he studied under the film philosopher Stanley Cavell, a disciple of Martin Heidegger. We know that he became so enamored with Heidegger via Cavell that he spent a semester at Oxford studying with him, wrote his senior thesis on his work, translated his lecture “The Essence of Reason” from German, and after failing to finish his PhD, tried to teach a course on the philosopher at MIT. However, none of these influences are so bound up with Malick’s films that the movies are impossible to enjoy without completing a reading list first. For all of his fascination with philosophy, history and theology, Malick’s art is primarily driven by picture and sound, much more so than most commercial filmmakers. Malick’s biographers seem to agree that filmmaking represented a continuation of his philosophical and spiritual inquiries by other means, and his cinematic inquiry has taken on a notoriously intuitive path. It’s impossible to “read” or decode Malick’s movies as if they were puzzles or riddles; one must instead enter into them, absorb them and in some ways surrender to them. But this way of describing the personal investment his films require is not to discount analysis; rather, it suggests that critique coming from some “objective,” arms-length perspective won’t begin to suggest the wealth of beauty and insight offered by his work. For me, the wonder of Malick’s cinema is rooted in a concretely expressed humility that contradicts the tendencies of all but a handful of commercial narrative films. The standard model for screenplays is a three-act story in which a protagonist pursues some sort of goal. Everyone else in the story is judged in relation to the hero’s quest, and thus everyone is slotted into particular roles that are determined mainly by how much they help or hurt the hero, and how much screen time they get: the best friend, the love interest, the mentor, perhaps a villain and his or her henchpersons. This is what you might call the geocentric model of narrative, reinforcing our selfish and myopic wish to believe that life revolves around us, when in fact we’re but one of billions of individual planets in a universe whose center is mysterious, and whose rules remain inscrutable no matter how hard we try to understand them. Malick never had much interest in the geocentric model of narrative, and over the decades he’s been increasingly pointed in his rejection of it. From "Badlands" onward the writer-director has made increasingly sprawling, swirling, visually and aurally collage-driven films. He’s become increasingly less interested in straightforward linear plotting and more inclined to ruminate, meander, and riff. This tendency manifests itself most strikingly in the way that Malick diminishes his protagonists. He often does this by reminding us that as emotionally overwhelming as life can be while we’re living it, we’re ultimately just intelligent mammals inhabiting the same ecosystem on the same small planet in the same unfathomably vast universe. The tension between the importance of individual desires and the indifference of society and nature fuels every creative choice he makes, and fosters that simultaneous, seemingly contradictory feeling that we’re on the outside and the inside of life at the same time, plagued by feelings of meaninglessness and hopelessness even as love and beauty reassure us that there is a point to everything—that all mysteries will be solved, all secrets revealed, somehow, some way. When I think of Malick, the first images that spring to mind are from a sequence near the end of his 1978 film, "Days of Heaven." The film is a historical drama about a love triangle between two lovers posing as brother and sister (Richard Gere’s Bill and Brooke Adams’s Abby) and the rich but sickly farmer (Sam Shepard) that they try to ensnare to provide a better life for themselves and for Bill’s kid sister Linda (Linda Manz). Complications ensue: Abby’s pretend love for the farmer becomes real, Bill becomes jealous and leaves her and then returns, there’s a struggle in which the farmer dies, and the intrepid trio takes off again, only to be tracked down by Pinkerton detectives. Bill fires on his pursuers and is shot dead, falling face down in the water of the river where he and Linda and Abby had pitched camp. A shockingly abrupt cutaway from Bill’s face in the water—in extreme close-up—gives way to a series of images of Bill’s body floating downstream, then to the detectives lifting his corpse from the water and Abby and Linda weeping. The most telling shot, though, is a wide shot of a group of children and adults on the riverbank, watching the detectives retrieve Bill’s corpse. All at once we’re torn out of Bill’s and Abby’s and Linda’s story, and thrown into a world beyond their troubles. We’ve just witnessed the end of a powerful love triangle climaxing in a man’s death by gunfire, but to the people on the riverbank, Bill is just a stranger who got shot that day at the river. We see this diminishing strategy again a couple of scenes later when Abby goes to a train station and watches soldiers boarding to go fight World War I. Europe has been in conflagration for years, it seems. The viewers, having spent most of the film isolated on Texas Panhandle farmland, were not aware of this. For most of the movie we had no idea of when, exactly, the story was taking place. When the seasons changed we didn’t know what year had ended and which one had begun. Malick does this time and time again, in film after film: he’ll cut from a moment of extreme, often subjective personal trauma to a wide shot putting individual experience in a cosmic context, showing you a field of waving wheat or jungle grasslands or undulating ocean waves, or coral reefs and fish, or sunlight streaming through canopied foliage, or insects or birds or animals. 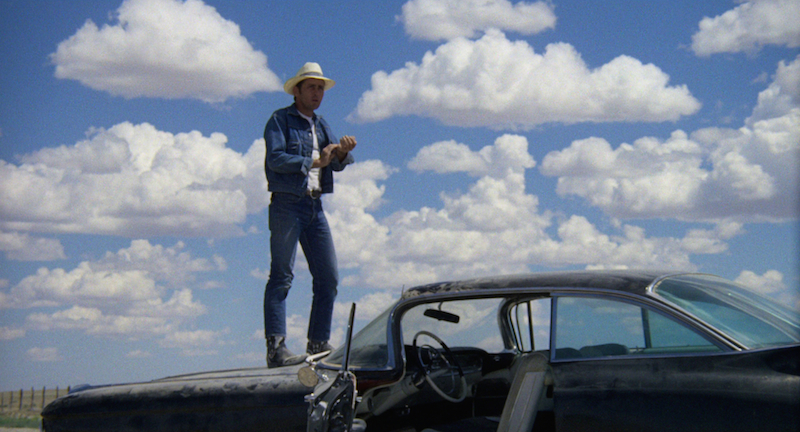 As early as Badlands, Malick was using cutaways to ironically puncture his characters’ delusions of centrality—cutting from close-ups of the fugitives Kit (Martin Sheen) and Holly (Sissy Spacek) slow-dancing by the road at night to a wide shot reducing them to silhouetted cutouts slowly spinning in the beams of a park car’s headlights, or cutting from one of Holly’s romance fiction-modeled diary entries (read in Malick’s trademark voice-over) to rack-focus shots of tree branches and leaves and beetles. "Days of Heaven" goes further still, showing the main drama (the love triangle) through the eyes of a barely adolescent girl who can’t fully understand what’s happening to her brother and his girlfriend, much less to the world they inhabit, and stressing the cyclical repetition of seasons, which obliquely suggest that the events we are witnessing will recur again, perhaps in a different guise—if not in these characters’ lives, then perhaps in those of others. In his war drama, "The Thin Red Line," which has multiple narrators, the mortal distress of grunts ducking bullets or screaming in agony is often diminished, gently but firmly, by cutaways to close-ups of animals: a snake surprising a Marine in tall grass during a firefight, or a first-person point-of-view shot of a leaf perforated by the teeth of long-gone insects, the sunlight streaming through the green as if through bullet holes. The film starts with a close-up of a crocodile gliding into green muck, as if to remind us of the dinosaurs that predated our sojourn in a past so distant that we can hardly imagine it, and its final shot isn’t of soldiers or war but of a sprouting coconut poking through surf. “Why does nature war with itself?” one of the film’s many narrators asks, reminding us that we are a part of the ecosystem even as we trample or burn it. Malick’s John Smith-Pocahantas drama, "The New World," has three narrators (though more often John, depending on which version you’re watching), juxtaposes the European settlers’ indifference to or contempt for nature against the natives’ deep connection with it, and presents the stories of both individuals and nation-states alike as hiccups on the world’s timeline, almost charmingly minor when considered in the shadow of tall trees soaring high above us, their branches creaking in the wind. "The Tree of Life" takes this approach as far as it can, framing its wandering, ruminative story as the memory of one man, an architect, but also dipping into the consciousness of his mother and father and other characters, pivoting back and forth in time without warning, and sometimes slipping into fantasies or reveries that show seemingly uncanny or overtly metaphorical events: a child swimming through a room in which the laws of gravity have been suspended; the mother floating in air like the matriarch in Andrei Tarkovsky’s "The Sacrifice;" the architect visiting a desert plain on which dead loved ones have gathered. The film’s oft-discussed, sometimes contentious, and certainly memorable creation sequence presents the architect’s life and the life of the human race collectively as the endpoint of billions of years of evolution. This seems, in context of Malick’s other films, like a way of gently mocking the geocentric model of drama, even as the film takes the characters’ pain and joy with utmost seriousness. It affirms the inescapable centrality of personal experience in each life while at the same time infusing that worldview with an awareness of the infinite breadth of time and space. Even his most recent film, "To the Wonder," practices this strategy of benevolent diminishment, imbuing shots of present-day suburban Oklahoma tract houses, ditches, and Sonic drive-in restaurants with a shimmering sense of possibility. The movie seems to detect a radiant, even holy beauty pulsing beneath or beyond the landscape that its characters often take for granted, and even contextualizes the movie’s longing for transcendence as a desire to get closer to God, or beyond ourselves (Javier Bardem’s ruminating priest serves as the mediator between the movie and us). We are not the centers of the universe, Malick’s films seem to suggest, but at the same time the storehouse of human experience is a given universe unto itself. This may be the essence of Terrence Malick: human beings are infinitely small and yet infinitely significant. Why? Because we ask why; because we wonder. It’s this sort of meaningful and sensible contemplation that many people seek by reading scripture, meditating, or visiting houses of worship. They seek to lose themselves to find themselves, and to contemplate their significance within the wider scheme, however large or small that may be. I can think of few better places to turn than this, a compelling volume on faith, spirituality, and cinema, when looking for the meaningful and the sensible. The Wes Anderson Collection, Chapter 8: "The Grand Budapest Hotel"